Ongi Etorri. Welcome to the Côte Basque. Our house is located in Anglet, an ideal starting point for all kinds of discoveries and excursions. Whether you more enjoy ocean or mountain, nature is at your doorstep ! The villa has a small exotic garden, very green, created by Sylvie and Pierre, before we pass the relay to welcome you in this charming B&B. We offer three rooms, both at ground level, each with their own entrance overlooking the garden. The rooms are decorated in a different style, with large comfortable beds, 160 or 180 cm (Bultex bedding for maximum comfort.) The bed of the "Sun" room is 180 cm, separable on demand into twin bed. Each room has a private shower room or bathroom, with separate WC. A hair dryer is available in each bathroom. A courtesy tray with kettle is also available. Continental breakfast served in the veranda or in the dining room. A summer kitchen area with fridge is reserved for you, as well as the necessary equipments for your picnic. Free Wi-Fi available. 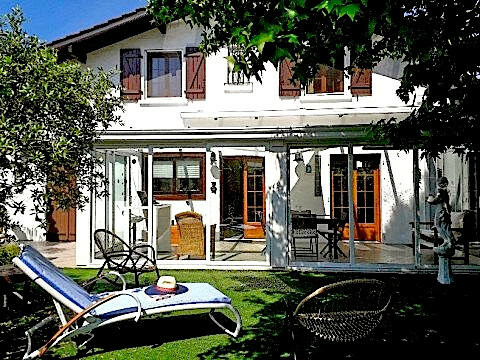 We are in the heart of the Côte Basque, near the city center and beaches of Anglet, and close to Biarritz and Bayonne. In July and August, there are free shuttles to the beaches, close to the house. We will be delighted to welcome you to the Pays Basque for a weekend or an extended holiday.